Advaita Candra Dasa has been associated with ISKCON for more than 15 years. He was born in Chennai, India in an orthodox South Indian family. Driven by years of search for God and a strong desire to go beyond the narrow religious orthodoxy, blind ritualism and misleading philosophies, when he was a college student, he became attracted to the scientific and universal teachings of Krishna consciousness as found in the books of the world-renowned spiritual leader, Srila Prabhupada, Founder-Acharya of ISKCON. He has since been an ardent student-teacher of Lord Krishna's Bhagavad-Gita and has given hundreds of lectures and workshops at venues such as Massachusetts Institute of Technology, Penn State University, University of Connecticut, yoga centers and temples. While a student at Penn State, where he received his Ph.D., he founded the Penn State Vedic Society and a magazine called Quintessence for disseminating the Gita's teachings. After his graduation and move to Boston area, he continued his academic outreach activities at MIT and founded the MIT Bhakti-yoga club, which has served hundreds of students for close to a decade. In 2008, he received spiritual initiation from ISKCON guru, HH Romapada Swami. 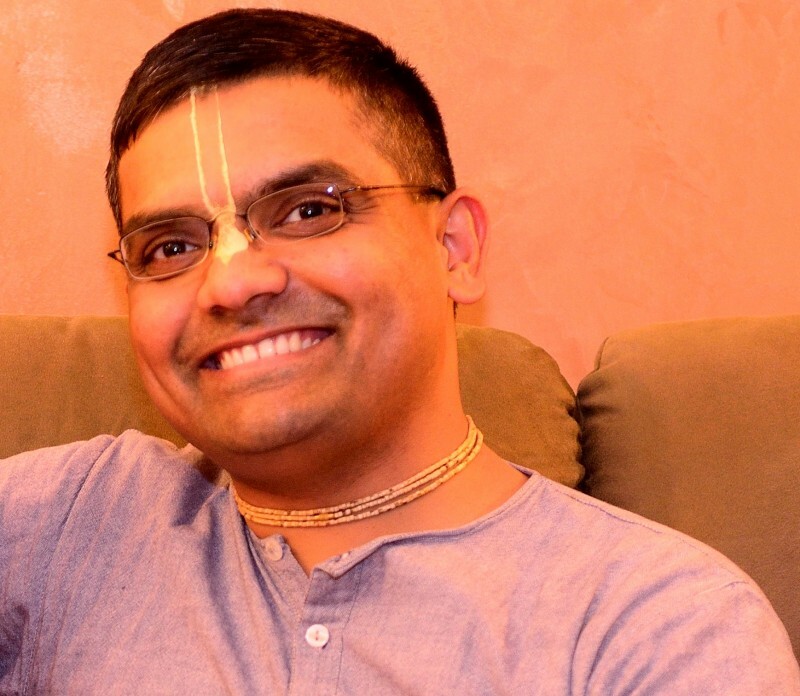 Under his guru’s guidance, Advaita Candra Dasa now serves as a mentor to both beginners and practitioners. Recently, he created Yoga24x7, a novel presentation of Krishna consciousness to make the teachings more accessible to educated audiences. His hobbies include spiritual reading and writing, nature trips, sports and spending quality time with his toddler. He currently works as a research associate and leader of a clean energy project at Saint-Gobain and lives with his wife, Krishna Priya devi dasi and son, Madanmohan in Northboro, MA. He is a member of Tau Beta Pi engineering honor society and a biographee in Marquis' Who's Who in Science and Engineering. He is available for speaking engagements and can be reached at [email protected] and through facebook. April – Materialistic Theism: Why Modern Religions Have Alienated Seekers? May – Can You be Spiritual Without Being Religious? September – Why is Suffering Proof of God’s Existence? October – How Do You Know What's Your Duty? November – Dislike Authorities? We Hear You, Meet The Bonafide Guru!